Suffering from Swelling or Pain? Then a Cold therapy machine is the best one that solves all your issues. Finding a genuine and guaranteed good machine online can be little risky, But we here at ReviewCart have solved this problem by providing you with The 5 Best Ice Therapy Machines that comes with a warranty. What Is Cold Therapy Machines? 1 What Is Cold Therapy Machines? Ice therapy system has tremendous capabilities to reduce swelling and pain caused by severe gym workout or other injuries. Healthcare provider or many physicians recommend it to deal with an injury that helps to recover from surgery by increasing your recovery time. Cold Therapy Machines uses motorized or non-motorized cryotherapy units which are designed to deliver cold, pain relief therapy on a specific part of your body that are inflamed and injured. 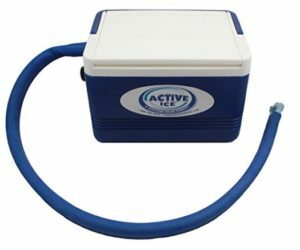 These cold therapy systems commonly use motors to distribute a strong and controllable flow of ice therapy to areas of your body that are in pain. Also, speed up cellular metabolism to prevent the secondary damage of tissue. With the help of these mechanisms, you can quickly lead back to a normal life. While using this product on the affected area, you should keep in mind that it is important to know you shouldn’t put on the padding directly to the skin. You need to uphold certain insulation between the pad and the skin. Few users prefer to keep a piece of towel that is similar to the size of padding contained within the ice therapy machine and which is used to prevent any skin damage. Ossur Cold Rush Cold Therapy System is built with a durable motor and has best flow rate up to six continuous hours than the rest top-selling therapy system. It is a leading industry that designed to provide less heat transfer and ice-to-water ratio with longer cooling effect. Works great, by combining the same motor which is used in much larger mobile air conditioners and refrigerators, delivers consistent cooling for any injuries and outstanding compression, even to high elevations. Easy to use that includes large shoulder pad. If the shoulder pad is large or needs for a specific purpose you can buy other attachment such as a universal pad or knee pad. No automatic timer which means you need to turn off after your satisfactory therapy time. Polar Active Ice Therapy System is motorized and has an adjustable flow rate temperature control. It is simple to use and has a large cooler compartment. It comes with 30-minute timer feature to protect the skin. This product provides a good ice therapy mechanism is a perfect choice if you are seeing for simple and effective cold therapy system. Polar Products comes with a 6 months guarantee. However, one customer claims that it is still working well even after using the product for more than 5 years. 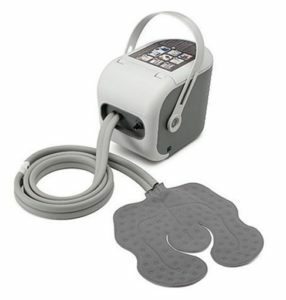 Ideal for – cold therapy system for knees, limbs, shoulders, back, ankles, calves, elbows, and much more. Quick detach couplings for easy disconnection when required. 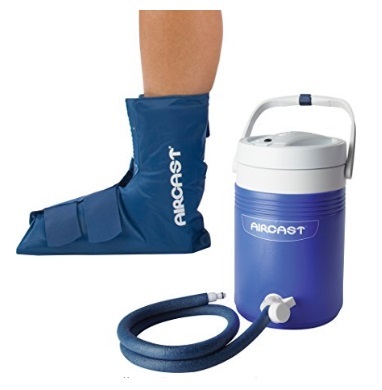 The Air cast Ankle Cryo/Cuff with Gravity Cooler is a non-motorized, gravity-fed system that delivers cold and focal compression. It is designed to provide maximum cryotherapy by supplying chilled water directly into a Cryo or Cuff to eliminate the risk of damaging tissue. The Gravity Cooler carries needed amount of ice and water to give 6 to 8 hours of cryotherapy. The Gravity Cooler comprises an insulation disk, tube assembly, and plastic fittings. Ideal for – managing pain, swelling, minimizing hemarthrosis, trauma, sports injuries, Rehabilitation and post-operative recovery. 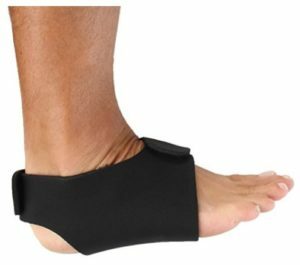 It is designed for universal fit permitting the Air cast Ankle Cryo/Cuff to be wearable on either the right or the left leg. The package consists of user manual with complete instruction to follow. Thus, helps user for easy usage. Cuff requisites manual pressing to acquire significant cooling all through. The Polar Iceman3 is well built cold therapy unit uses semi-closed loop circulations system to maintain accurate and consistent temperatures for safety. Its clear cooler makes it easy to check if an ice refill is required and comes with universal pad keeps water in the pad at or above 40 degrees F. it also includes long Velcro straps for easy application to various parts of the body. It lacks on and off switch that needs to plug or unplug as needed. Ultra-Quite, Cooler preserves Ice bath cold for 7-9 hrs. 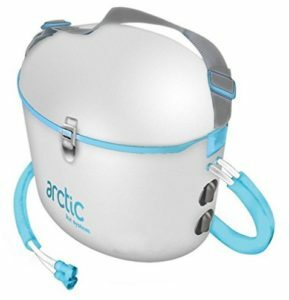 Pain Management Arctic is a portable and cheaper alternative ice cold therapy system benefits to lessen pain, swelling and eases normal recovery. It uses a patented semi-closed loop system and lets accurate water temperature control. It’s very effective in providing cold therapy with continuous circulation compression technique for various injuries up to 7 hours and has two switches – on/off and a timer with continuous mode. The motor produces an audible hum, which is not loud enough to be considered a disturbance. Its universal cooling pad can be connected to 6 inch fully insulated hoses. It can keep the cool water up to 6-8 hours on one single fill-up. This cold water therapy appliance is a good deal if you are looking for a smaller and low – price cryotherapy device. We have listed all The 5 Best Ice Therapy Machines depending on performance and customer reviews. We advise you to consult your physical trainer or physician to seek supervision and advice before using any product.